Advanced Sheet Metal Fabrication Techniques is a photo-intensive how-to book. See Craig Naff fabricate a Rolls Royce fender, Rob Roehl create a motorcycle gas tank, Mike Pavletic repair an Alfa Romeo, Ron Covell form part of a quarter panel midget body, and Fay Butler shape an aircraft wheel fairing and the front section of a Lotus race car. Demonstrations include use of the English wheel, power hammer, shrinkers and stretchers, and of course the hammer and dolly. Sequences in aluminum and steel. From building the bugk to TIG welding the panels. 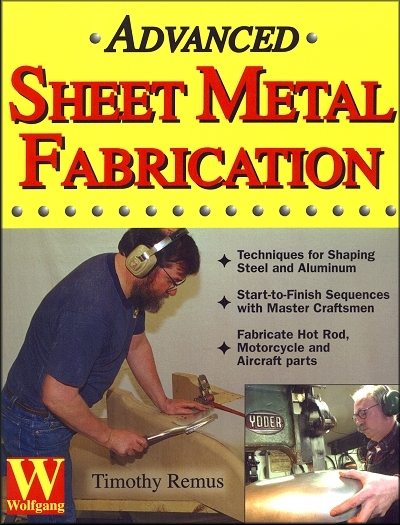 Includes interviews with expert metal shapers. Automotive, motorcycle and aircraft projects. The projects presented in this book involve multiple panels, each of which must be designed, cut, shaped and then joined to the others to create the finished fender or gas tank. Photo sequences cover building the buck, creating a paper template, cutting the steel or aluminum, forming the piece, welding the panels, and finishing the seams. Ask a question about Advanced Sheet Metal Fabrication Techniques. A Division of iSite Enterprises, Inc. Copyright © 1997-2019 TheMotorBookstore.com™. Site designed & developed by YourStoreWizards.